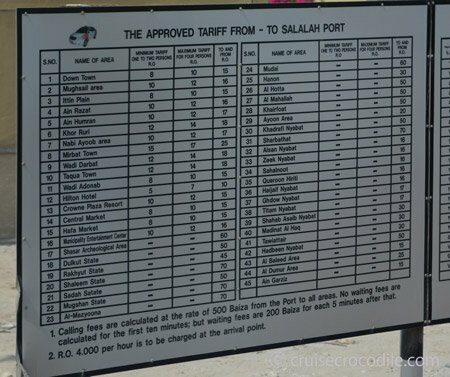 Our Salalah cruise port guide gives you information about the docking location, cruise dock, transportation options and much more! 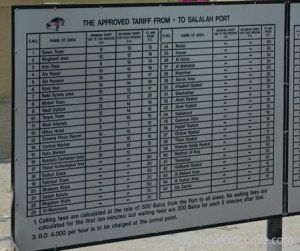 Welcome to the Salalah cruise port guide. 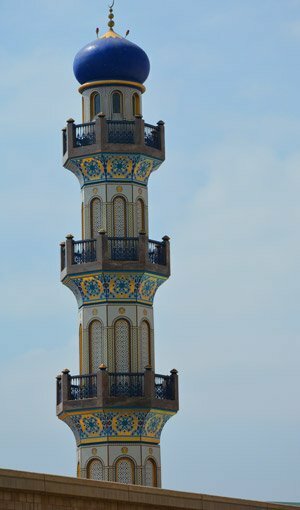 If you want to go to the true middle east you will find a very nice example in Salalah. Salalah is the 2nd biggest city of Oman with a little over 200.000 inhabitants. It has that great combination of the traditional Omani heritage and an international lifestyle. Salalah is also known as the “perfume capital of Arabia”, because the Frankincense produced here is the finest in the world. The city centre of Salalah is quite nice, although not as nice as capital city Muscat. You’d might be especially interested in the surrounding area’s of Salalah. Think of the city as a true look into Arabia without all the fairytales around it. As soon as you step out of the city you are surrounded by majestic mountains, a vast desert and there truly is a lot to do in this area. Find some suggestions underneath. Oman and Salalah are a suprise to many and for many this is an eye opening experience. Many wouldn’t think the middle east can be so friendly and so incredibly safe. 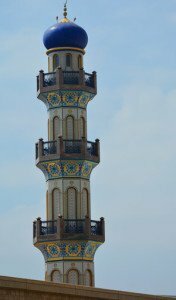 But as you will drive the clean and quite streets of Salalah you can figure out that this is country that has things figured out. Watch Oman closely as this might just be the next up and coming country. This is the view from the ship that you’ll have over the port when your ship is docked. This is at the exit of the port where the taxis are waiting for you. The taxi prices are also on display at the exit of the port. Check these prices before negotiating with the taxi. How are you? – كيف حالك؟ – kayf halk? Cruise ships dock at the port of Salalah. For your call in Salalah it is best to come prepaired as it is a difficult one to do independently. First of all your ship will be docking about 20 km away from the city centre of Salalah. If you step onto the highest deck of your cruise ship you can see there is literally a dessert between you and the town. You will be docking in a huge container harbour where it is prohibited to walk and so you have 2 options on how to leave the port: you either leave the dock through an organized shore excursion or you take the shuttle bus that your cruise ship will provide and continue by taxi. Check with your cruise ship if this shuttle bus will be available and where the drop off location will be. Most of the time the drop off location will be at the exit of the port, which is about a 2 minute drive from the pier. So you are still miles away from anywhere and unfortunatly this is not because the ship is not willing to take you anywhere but because it is against the local rules. If you take the shuttle bus to the exit of the port the left hand picture will show you what you will encounter. This is where the taxi drivers are waiting for you. Taxis in Oman do not run on the meter. You simply need to negotiate upfront. Therefore the port displays the prices on a sign. Use these prices so that you know what you have to negotiate for. 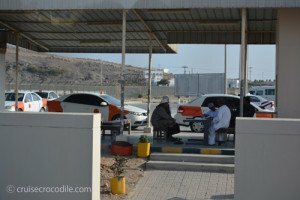 Keep in mind Oman is already an expensive country and taxi prices here can be quite high. And although this port in the past was known for its rip-off prices, it is getting better and more descent nowadays. Take into account that a simply taxi tour of a couple of hours will cost you about 80 USD. 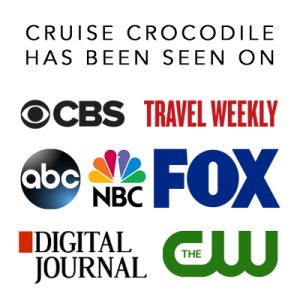 We still however recommend to prearrange a shore excursion to make sure you can skip the shuttle bus service and the negotiations. On the pier of at the exit of the port there are no facilites or other services available than the one described above. – How far is the city centre? It is about 22 km drive to the city centre from the port. – Is there a tourist information centre? This is not available at the dock. – Where can I ride a camel? These facilities are not available in Salalah? – Is Oman safe? Yes, it is one of the safest countries in the world. – Is Oman expensive? Depending on what your perspective of expensive is. Prices are about the same as the western world. – Where can I find a frankincense tree? In town you will only find one at the Al Balid musuem. Out of town you’ll find them at about a 30 – 45 minute drive to the north east of the port. – What is the color of the official taxi of Oman? It is white with orange. – Do the taxi’s have a meter? No, you negotiate prehand. – Do taxi’s take US dollars? Yes, generally they do. – Can I go sunbathing on the beach? Yes, you can although we would recommend to go the the Hilton hotel for example. This one is the closest beach to port and you’ll have all the facilities available. – Do the people speak English? All people speak Arabic and tje mayority will speak English as well. The “castle market” is a small market where you’ll see a lot of the traditional products Oman has to offer like clothing. daggers, perfumes and scarfs. This is especially also the place to buy Frankincense. Make sure the locals tell you what to do with it and how to use it. You can pay with US dollars on the market. It is not the most spectacular things to visit although the drive to it is very impressive. For most of us It is one of those “been there, done that” things. From port it is 30 km / 45 min drive to the North. The palace from the 19th century used by many generations of Sultans. 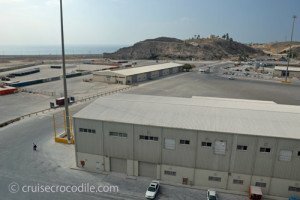 Sultan Qaboos might have moved to Muscat, but is still used as his summer residence. A immense complex of palace that make up the perfect spot to welcome important guests with hundreds or luxurious apartments right next to the palace. There are still several Frankincense trees to find in the desert of Salalah. At about 45 minute drive into the North West direction you’ll find them next to the road. Make sure to make a cut and have smell. If you are on the scout for the best frankincense in town make sure to check the color! The best quality is almost transparent with green glow. Did you know you cannot just burn this stuff, you can also make tea out of it and originally it was used as a gum to chew on. Go try it yourself. Frankincense has a medicinal power so you can never go wrong. This is what the official taxi’s look like. White with orange. They do not have a meter. The taxi driver often speaks English and will take US dollars. Cruise ships dock in the regular container port of Salalah. There are limited facilities at the cruise dock and keep in mind you will need transportation to visit the city center. More information on this can be found in the full cruise port guide on Salalah.